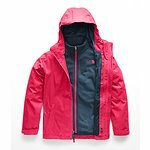 This might be specifically designed for girls but it is constructed with the same technical fabrics as the adult counterpart. This versatile 3-in-1 jacket pairs a waterproof shell with a removable, fleece liner jacket. She'll bundle up in both to stave off the wet and cold, or wear them separately when the weather permits.